In a medium pot, soak rye berries in room temperature water overnight. Add the salt to the rye berries and soaking water and bring to a boil over high heat. Reduce heat to low, cover, and simmer for 1 1/2 hours, or until berries are cooked through. Some berries may split open during cooking. In a small pot, bring water to a boil over high heat. Remove from heat and soak the dried cherries in the water for 3 minutes, or until soft. Drain and discard the soaking liquid, then roughly chop the cherries and reserve. In a large skillet, heat oil over medium heat. Add shallots and cook for 1 minute. Add celery and cook for 2 minutes, then add cannellini beans and cook for 3 minutes. 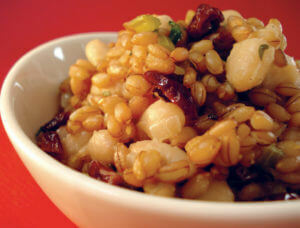 Remove mixture from heat and stir in the cooked rye berries, reserved cherries, green onions, and parsley. In a small bowl, combine water, lemon zest, lemon juice, salt, and black pepper. Add oil in a steady stream and whisk together until emulsified. Add dressing to the rye berry mixture and toss until well incorporated. This recipe comes from my recently released book, What’s Your Season? Healing Principles and Recipes for Your Body Type.